In the 13th century, the knight’s basic harness began to change. By the second half of the century, the helmet had grown into a great helm that protected the entire head. Small, plate defenses were added to the knees and elbows, and a variety of simple articulated defenses were being experimented with for body armour. All of these changes merely heralded the sweeping changes of the 14th century, which would end with the knight fully-encased in plate armour and well-trained foot soldiers dressed in a combination of quilted, mail and plate defenses that often equaled the knightly kit of a century before. Reproduction of an early 15th century longsword, found in the Museo Civico L. Mazzoli, Brescia, Italy. In the same period swordsmiths had begun developing a new, versatile weapon, the longsword. 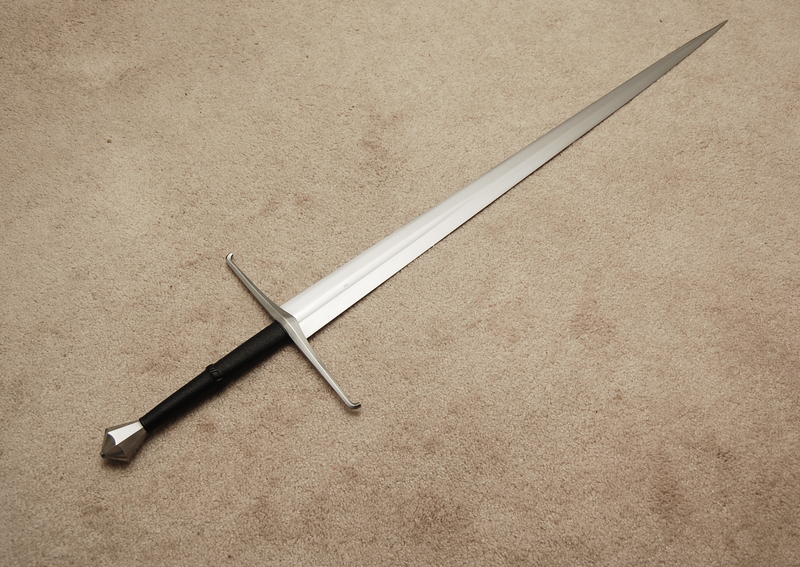 Wielded with one hand on horseback, the longsword was generally used with two hands when fighting on foot. While there are early references to two-handed swords from the 12th century, it was only with the adoption of heavier armour, and thus the diminished role of the shield, that the longsword came into prominence. This new weapon generally measured between 44″ and 54″ [112 and 137 cm] in length, and was stout enough to deal with fully armoured foes. Yet at roughly three to four pounds [1.4-1.8 Kg] in weight, it was also fast enough to use against lightly and unarmoured opponents. 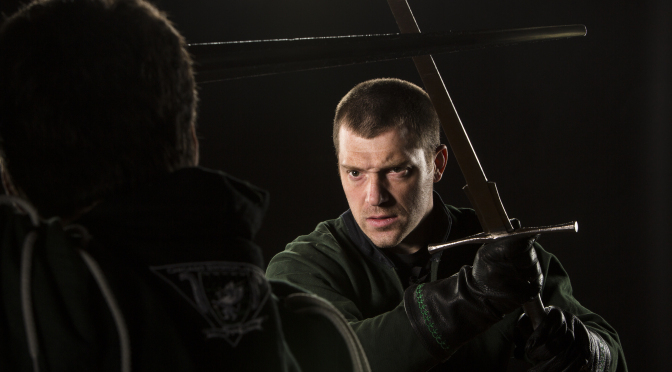 Like the arming sword it evolved from, the longsword’s straight, double-edged blade was ideally suited for both cutting and thrusting. Blade shape could be flat and wide, narrow and hexagonal, or diamond shaped. Characterized by having both a long grip and a long blade, it was yet capable of being worn on the body. This versatility made the weapon extremely popular with the knightly classes; so much so that this so-called “sword of war” also became an element of civilian dress in the late Middle Ages and Renaissance. The two masters of the Dei Liberi School who have left us records seem to have favored somewhat different weapons. Fiore dei Liberi shows a relatively short weapon, with a blade little longer than that of an arming sword; in fact, the same sword used throughout the single-handed, two-handed and armoured combat sections of his manuscript. An excellent example of such a surviving sword, contemporary to Il Fior di Battaglia, resides in the Museo Civico L. Mazzoli in Brescia, Italy. as it appears here in my writing. do this and you won’t be in trouble. its duty being to wound and cut. Following Vadi’s measurements produces a weapon between 50-54″ inches [127-137 cm] in length. Despite this difference, the two masters illustrate the same general techniques within their treatises, and practical experimentation has shown that any weapon within the 44-54″ [112-137 cm] length range can be used, shorter blades playing faster in close and allowing for single-handed play, longer sword playing better at a distance.